Have you ever had an idea for a revolutionary product or marketing campaign, that you built on pure adrenaline, launched, ... and then waited as tumbleweeds blew by? Have you ever set up a blog, posted a bunch of great content, and then ... tumbleweeds? Have you ever been involved in any project that you knew would change the world, if it could just achieve "critical mass" ... but didn't? We talk about "viral marketing" and "memes" -- campaigns and ideas that catch fire and spread from person to person on their own power. We talk about "tipping points" -- where a movement takes on a life of its own, and can no longer be stopped. One of the key ingredients to these kinds of explosive growth is "critical mass". The concept of critical mass comes from nuclear fission. You have to have enough nuclear material for it to power its own reaction and keep it going. If you don't have enough, you have to pump power in to keep the reaction moving. When you do have enough, you get extra energy out that you can use to generate electricity (or blow stuff up -- but let's hope we don't see any more of that). Viral marketing is similar: until you reach critical mass, you have to keep working and spending to drive the campaign. Once you reach critical mass, the rest is free. With my brother and I launching a new business (one that I believe could really benefit a lot of people -- my brother's a smart guy with lots of knowledge and experience), I've been thinking about viral marketing lately. And I've come up with some ideas and different perspectives, which I'd like to share with you. Ideas don't spread on their own, no matter how powerful they are. 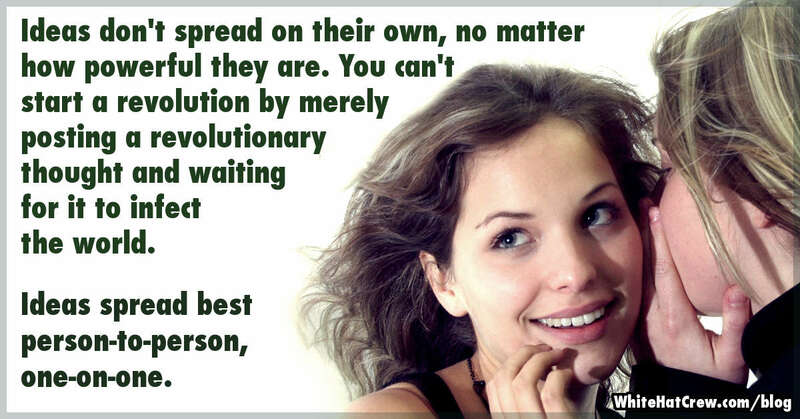 You usually can't start a revolution by merely posting a revolutionary idea on your blog and waiting for it to infect the world. Ideas are spread by people, person to person. To make an idea go viral, you've got to set up a mechanism for person-to-person spread. Social networking and sharing sites are one such mechanism. The personal connections are in place. The tools for sharing ideas are in place. Inject an idea. If it's good enough and you get it to the right people, they'll share it, and it will spread. But sharing websites don't always provide a close enough personal experience to sustain the spread. If you can find ways to make things more personal -- to give them an offline component to move them into the physical world -- you'll make them more infectious. The viral exponent is an idea that describes how fast an idea grows...or dies. You know the basic concept -- 32=9 (ie. 3 squared, or 3 x 3, equals 9). The "2" in that formula is the exponent. 33, or 3 x 3 x 3, = 27. A bigger exponent gives a bigger result. If you have an idea and spread it to one other person, and they spread it to one other person, and they spread it to one other person...the idea will keep spreading, but each generation will stay the same size. The viral exponent for that idea is one. X1=X. For an idea to grow, its viral exponent needs to be greater than 1, even if just by a little. For example, 101.041=11 (approximately). That extra 0.041 is plenty to make the idea grow. On the other hand, 100.954=9. The idea will spread a little, but that loss of 0.046 will doom the idea in no time, as each generation is smaller than the last. The thing about the viral exponent is that it isn't the same for each person in the movement. Some people don't share the idea at all. Others share it with one or two friends. Still others share it with hundreds. So you may think that you need to package your idea in a way that will appeal to the people who have the drive to push up your viral exponent. And that's true. But you have to do it in a way that doesn't scare everybody else away. The driven few can talk all they want, but if nobody has the guts to follow them, the idea dies. Some people are followers. Let them follow, and not feel bad about it. Some people are willing to share a little. Let them feel good about that. Others want to use your idea to change the world. Make a place in the movement for them. When we think of critical mass for an online community, for example, we usually think about the number of people we need involved to keep it interesting and valuable, so they'll stay involved and make it grow. And while the people are a critical component, they're not the only component. Sometimes, what dooms a project is too many unsolved problems. What you need is a critical mass of ideas or solutions. Back in April, I posted on my personal blog about a little project of mine where critical mass involved only one person -- me. For years, I've known that I needed to exercise regularly. Every once in a while, I'd try to get started. But every time, the effort would quickly fizzle. For several years, the main determining factor in how much exercise I got was how much snow fell on my driveway. I would define critical mass as the minimum combination of elements necessary to create a sustained change. For my exercise routine, those elements were one person, and one idea for an exercise routine. Did my exercise routine change the world? No. Did it change my world? Heck yeah! My past efforts at sustained exercise didn't fail because they didn't change the world. They failed because they didn't change my life. In addition to the business my brother and I are building, I've got a few ideas that I want to push to critical mass. And if they're of interest to you, I'd like to invite you to join me. The second, which I'd like to get going now, is related to Blog Riffing and my company's blog network. You don't have to be eligible for the blog network to get involved (though I personally think many bloggers would benefit from using my tools). What I'd like to do is start organizing some Critical Mass Teams for Blog Riffing, commenting, and guest blogging -- groups of bloggers of related topics and similar skill levels who make a commitment to Riff and comment on each others' blogs regularly, and guest post occasionally. If you're interested in being involved, even if not as part of my Critical Mass Team, let me know. If you have access to my blog network, list your blog(s) there, and also be sure to add a contact link (and preferably, a Gravatar) to your profile, so that people who find your blog there will be able to contact you easily. I'd also be happy to provide feedback to people who are trying out Blog Riffing, but may not feel like they've entirely worked out how to add the value to really make their posts their own. One final request: if you like this post, and when you come across good content elsewhere online, don't be too slow to use those social sharing buttons (see that tab at the top of page?). If it's good for you, it's going to be good for other people too. You're doing your friends a favor when you share it with them.